Active’s Handwork Department looked like an interior design showroom last week as we put together sample swatch packages for Baker Furniture. 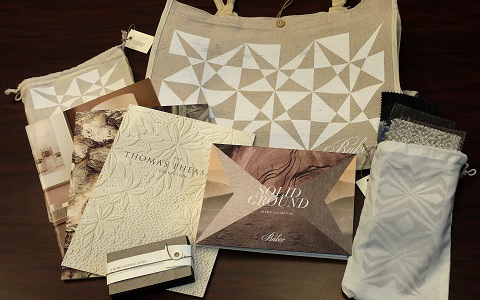 The swatch packages were needed for the biannual High Point furniture tradeshow in North Carolina, and are also being distributed to Baker’s showrooms and selected customers. We received large fabric samples and cut them down to swatch size. We outfitted our cutter with a special blade to replicate the zig-zag cut of pinking shares. Swatches were either hand-glued into swatch books or collated and inserted into a special screen-printed bag. The packages also include wood samples, which were placed into a hand-tied belly band.